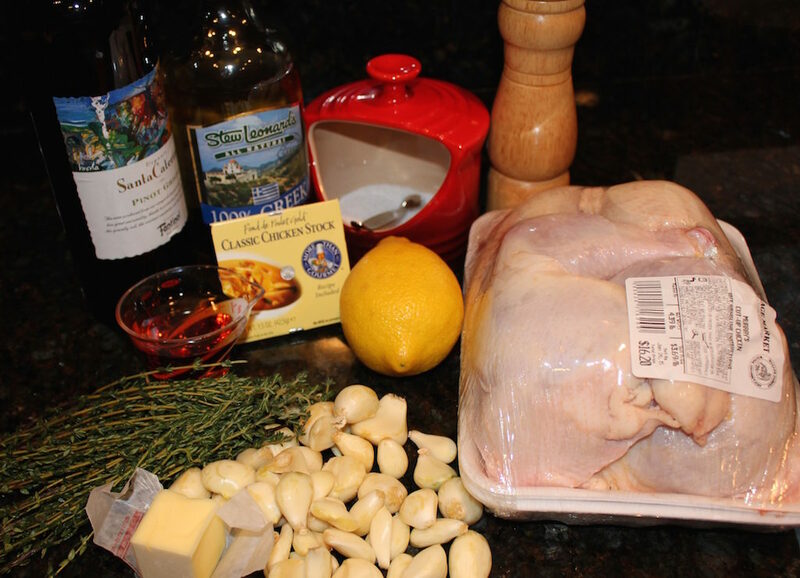 I’ve seen this recipe for Chicken with 40 Cloves of Garlic many times and just couldn’t wrap my head around the 40 cloves of garlic. It’s ironic because I love garlic and use it in almost everything savory. This recipe offers me a rare opportunity to use the whole chicken with bone in and skin on. 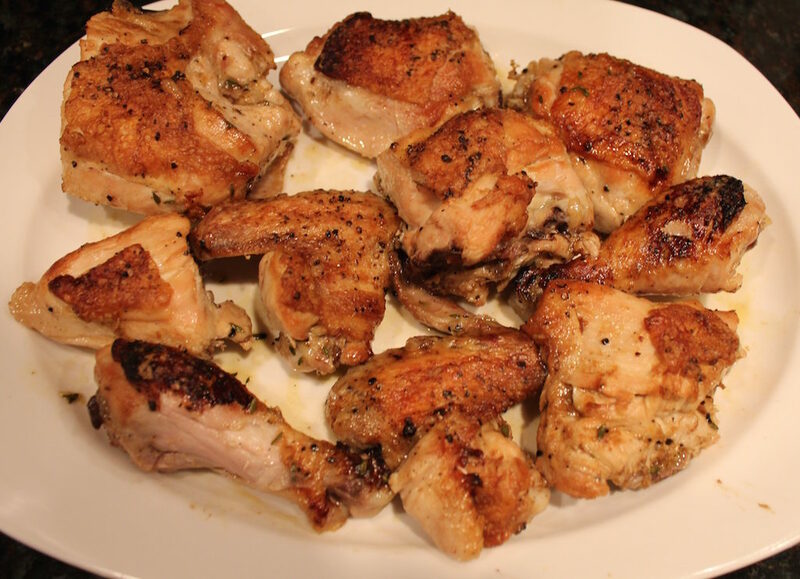 I love the crispy chicken skin and the flavor it imparts to chicken and prefer dark meat over white. My husband, unfortunately, only eats skinless, boneless chicken breasts Delicious, but limiting. Peeling 40 cloves of garlic is a bit time consuming. I recently saw this new technique for peeling garlic where you put the garlic cloves in a container, close it and shake for 20 seconds. The garlic is supposed to come out completely peeled. I didn’t have much success. It loosened the skins, but I still had to peel them. I don’t know if I didn’t shake hard enough, but I’m back to smacking the garlic with the flat side of the knife. It works better. 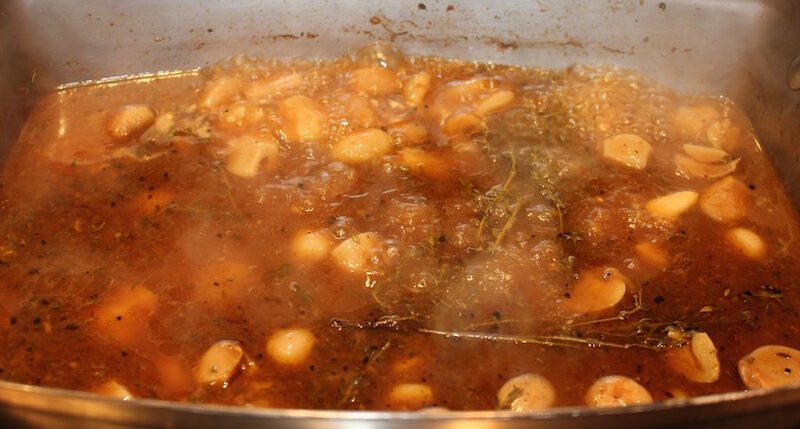 The sweetness of cooked garlic is apparent in this delightful sauce. 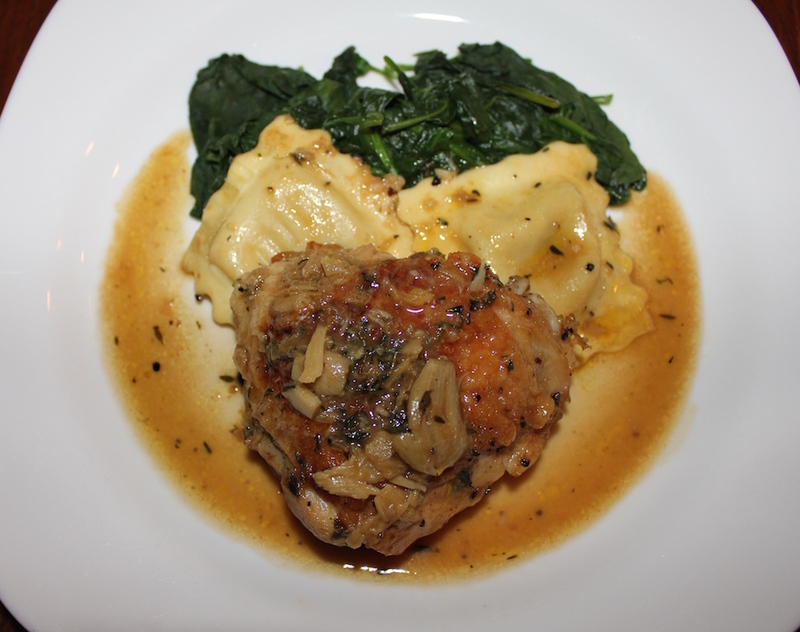 I boiled up some ravioli and steamed spinach to serve with the chicken and the sauce was delicious with all. This is definitely a chicken dish that we’ll have over and over again. Can’t believe I waited so long to try this. Spread the garlic over the bottom of a roasting pan and lay the thyme sprigs across the top of the garlic. Season the chicken, both sides, with the salt and pepper. 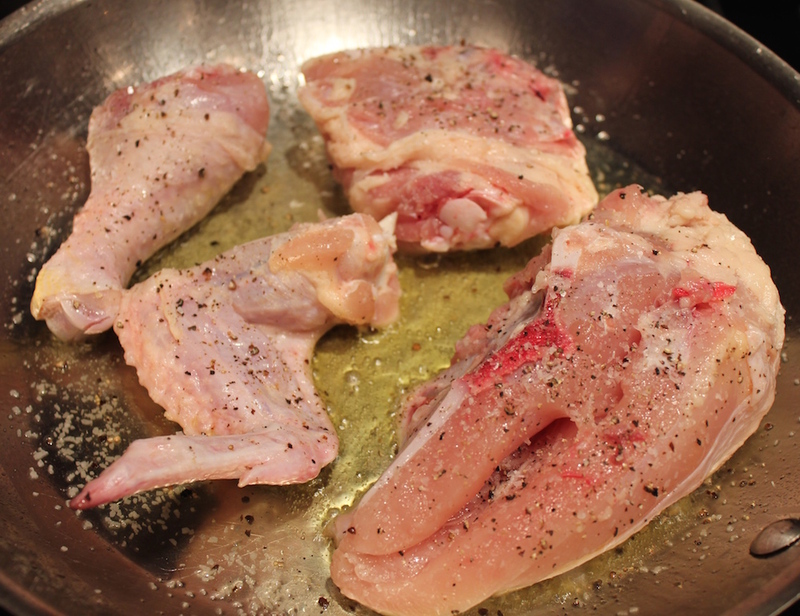 Sear the chicken for three minutes, skin slide down. Don’t crowd the pan, sear in batches as needed. Turn and cook for one minute more. 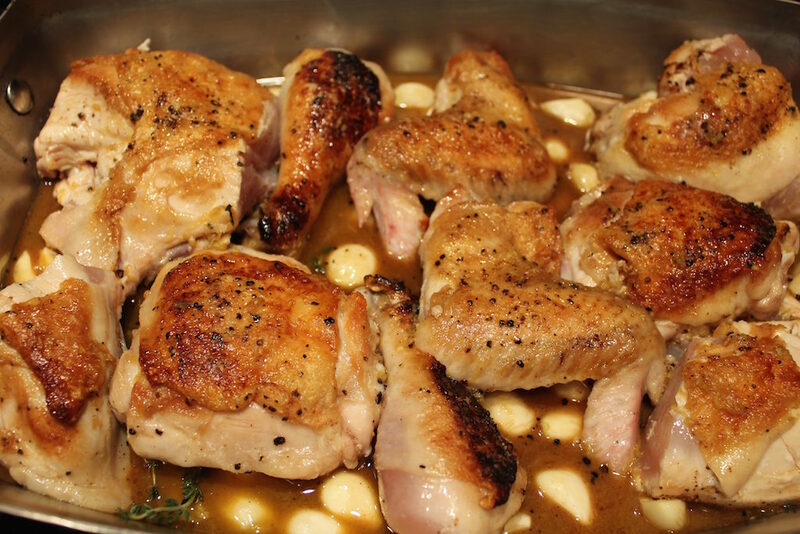 Lay the seared chicken on top of the garlic cloves and thyme sprigs in the roasting pan. Add the cognac and wine to the frying pan, bring to a boil and deglaze the pan by scrapping the fond with a wooden spoon. Reduce the liquid to one-quarter cup. Stir in the chicken stock and lemon zest and bring to a boil. Pour the sauce over the chicken and bake for 45 minutes, or a little longer if refrigerated, or until the chicken registers 175ºF on a meat thermometer. Note: The chicken can be made ahead to this point. Cover and refrigerate. Take out of the refrigerator about 30 minutes before roasting. 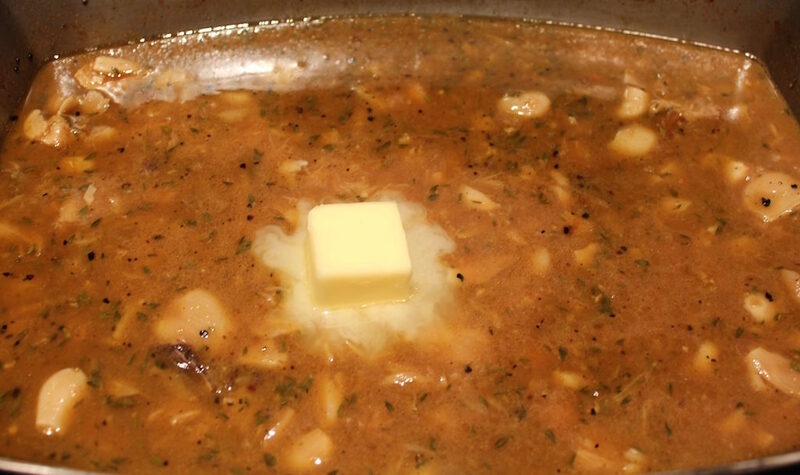 Boil the sauce to reduce it for five minutes. Discard the thyme sprigs, whisk the lemon juice, minced thyme and butter into the sauce. At this point, you can leave the sauce as it, mash the garlic or blend to a puree in a food processor or with an immersion blender. Pour the sauce over the chicken or serve on the side. 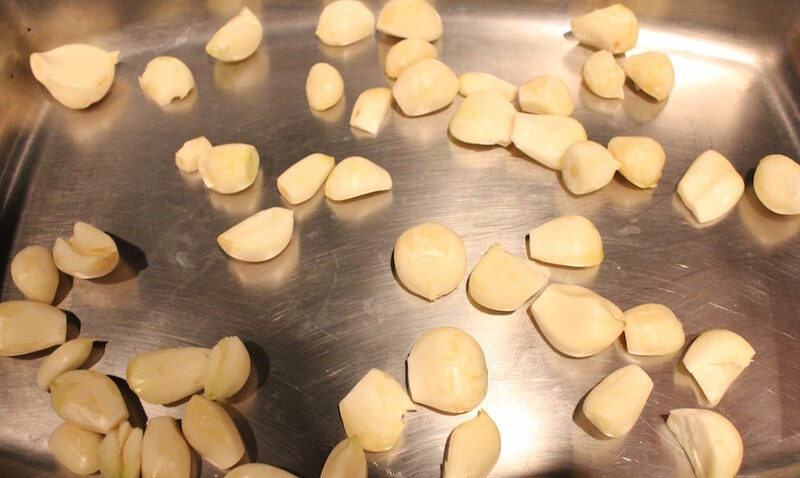 If the garlic cloves are large, cut them in half to make sure they soften. There is more than enough sauce for the chicken. 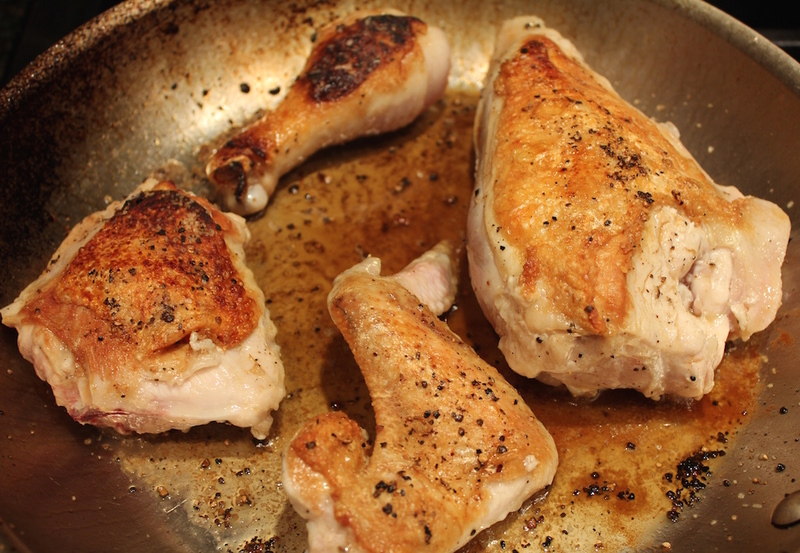 Use the extra to sauce pasta or rice as a delicious side with the chicken. 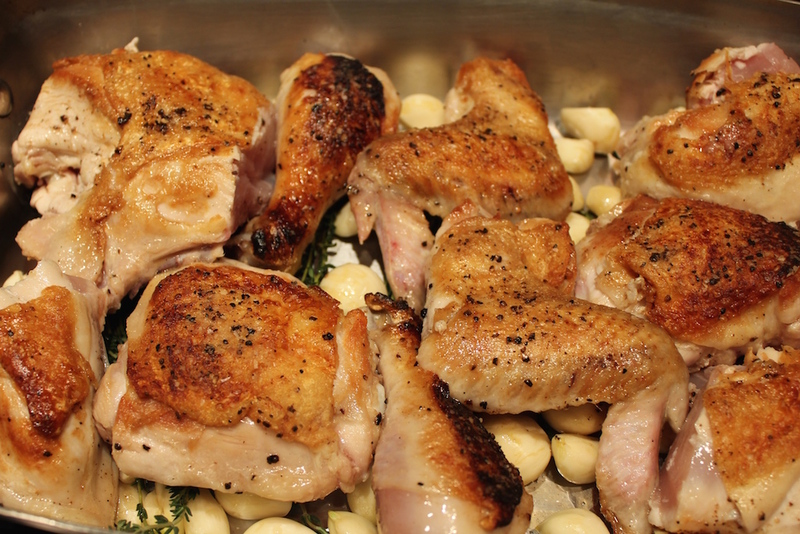 Lay the seared chicken on top of the garlic and thyme in the roasting pan. 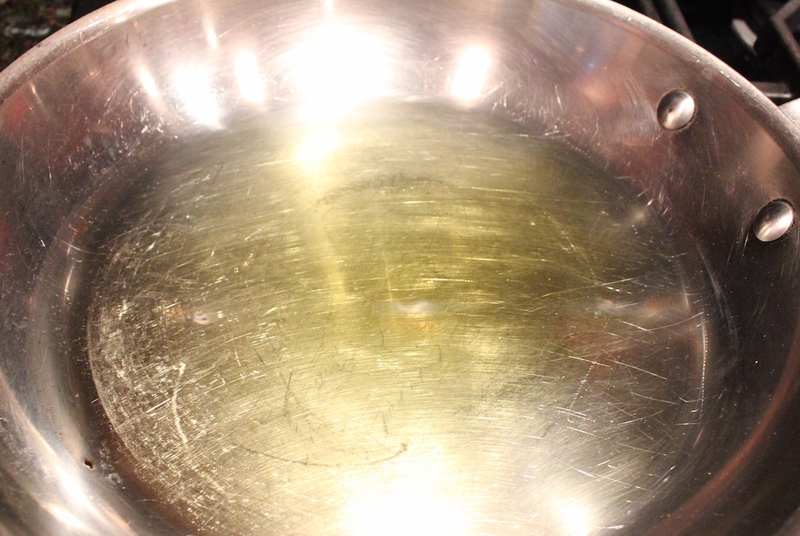 Add the cognac and wine to the frying pan, bring to a boil and deglaze the pan by scrapping the fond with a wooden spoon. Reduce the liquid to one-quarter cup. Stir in the chicken stock and lemon zest and bring to a boil. Bake in the preheated oven for 45 minutes or a little longer if refrigerated. 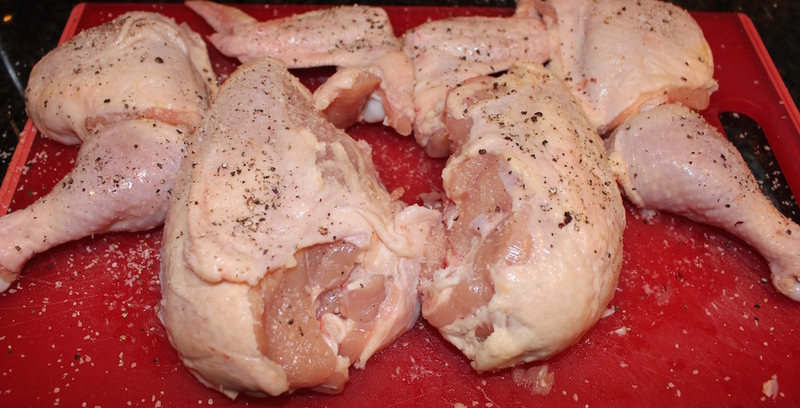 The chicken is done when the internal temperature registers 175ºF on a meat thermometer. Remove the chicken to a warm platter and boil the sauce to reduce it for about five minutes. Discard the thyme sprigs, whisk in the lemon juice, minced thyme and butter into the sauce. 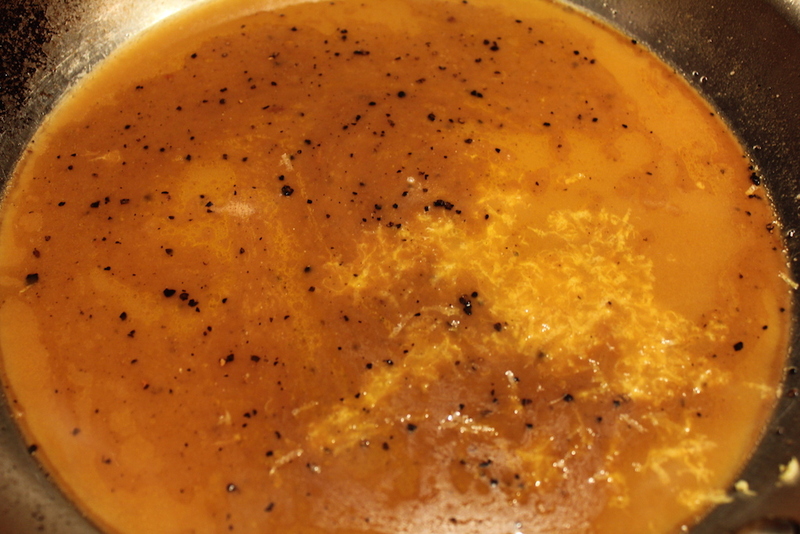 At this point, you can leave the sauce as it, mash the garlic with the back of a fork or blend to a puree in a food processor or with an immersion blender. The chicken can be made ahead to this point. Cover and refrigerate. Take out of the refrigerator about 30 minutes before roasting.